I have no idea why someone decided to decorate their pumpkin sale with sombreros. I never did take Spanish, so forgive me, but did I miss something in elementary school? Did the tradition of carving pumpkins originate in the remote hills of Chihuahua, Mexico? That said, it sure did make for some festive photography around piles and piles of overpriced pumpkins, overshadowed by giant Mexican hats. Plus for as long as this kid sat down scrutinizing pumpkin candidates, he was bound to get sunburned without protection. 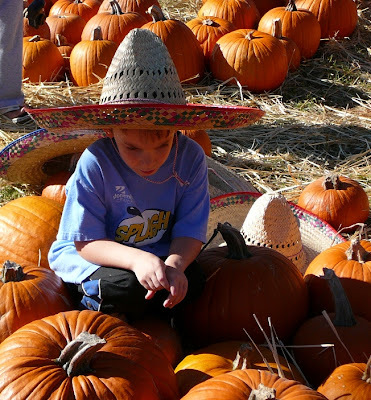 Maybe…there are only five degrees of separation between a pumpkin patch and a fiesta. I can vouch that there are just two degrees of separation between a pumpkin patch and an empty wallet. You are too funny! I’ll venture to say that sombrero/pumpkin combinations are likely to become as commonplace around here as “holiday trees”. GREAT pictures! And yes we just did this too so the pain our wallets are experiencing is so very fresh…. they do seem to cost more and more each year, what is up with that? ?